For the most part, Ditko did full artwork for his work for Charlton. The main exception to that is the 1965-1967 revival of Captain Atom, inked by Rocke Mastroserio and later Frank McLaughlin. 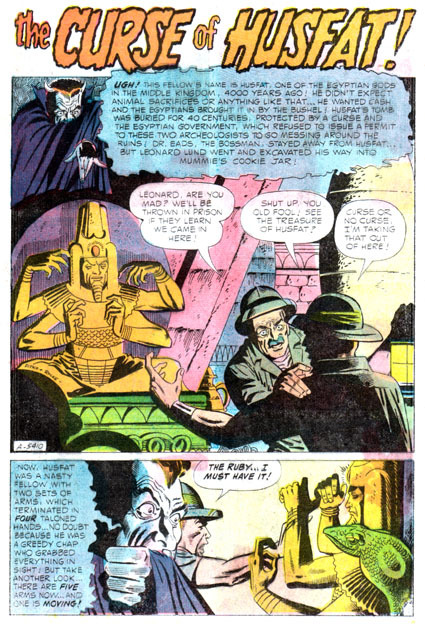 In that same era, a number of Ditko's short stories for the various ghost books were also inked by Mastroserio. This issue of CHARLTON CLASSICS, a series which reprinted Sam Glanzman's HERCULES series from the 1960s, also reprints one of the Ditko/Mastroserio stories, "The Ghost of Husfat", a 7-page story from GHOSTLY TALES #56 . This is your typical story of curses found in Egyptian burial grounds, with the younger of two archaeologists getting greedy for the forbidden treasure, which eventually seals his fate. It's a pretty good looking story, with the inks maybe being a little softer and less detailed than Ditko's own of the era would be, but seeming to be true to the pencils, capturing a lot of the atmosphere and storytelling that elevate these little morality plays beyond what they normally are. 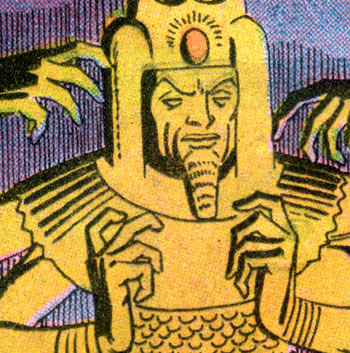 And Ditko doing Egyptian imagery is always good to see (no mummies in this one, though).